About the actual tank. This was a late war build, according to 'The Encyclopaedia of German Tanks of WW2' (by Chamberlain, Doyle, Jentz) and was instigated by General Guderian who demanded better defence against fighter bombers. The 3cm Doppelflak 303 (Dual AA mount) was the same as was planned for U-Boat defence, but was not actually used. The book advises two Flakpanzer IV Kugelblitz were made, delivered in February 1945, and no known combat history for these. Other sources on the web advise that 5 were built and delivered December 1944, and at least one was destroyed in combat against american armour in April 1945. The kit. This kit comes with 4 sprues, set of instructions and painting guide, and a set of decals. 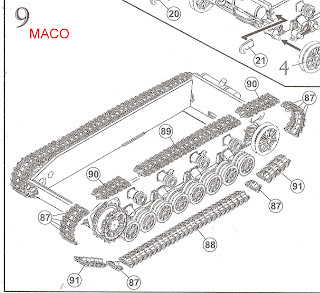 3 of the sprues are Revell's Panzer IV, and one sprue is MACOs, containing the parts to make the Flakpanzer. The box is perhaps the strongest I've seen, which is a good thing, as though my box was a bit flattened from its trip across the world, no parts were damaged. The Build. I have never built the Revell Panzer IV, so was pleasantly surprised that everything went together so well. I have not built any Revell kit for many years, so was not sure what to expect, though I had heard good things about their Panzer IV. The Maco parts have been engineered to a very high degree, and fit in nicely with the Revell parts. The Instructions - these are quite clear & include a page with a cloured painting guide, but there is one thing to be aware of - the diagrams show to attach the tracks in what is normally considered the wrong direction. Those familiar with Panzer IVs will pick this up straight away, however I followed the instructions and as a result the tracks are on in what is usually considered the reverse direction. Perhaps the hardest part of the construction, removing the track pieces and affixing them. I glue the individual links to make runs of 7-8 lengths BEFORE attempting to affix them, and let them semi dry before bending them around the front sprocket or rear idler for a neat and clean result. I don't recommend anyone try gluing the links around the sprocket one at a time. Tracks affixed. I use Humbrol Precision Poly to attach the lengths to each other, and liquid CA glue, applied with a small brush, to actually stick the tracks to the sprockets and wheels. The CA glue will not melt polystyrene and is so thin that when it dries it is invisible. Another view of the tracks. I endeavoured to put a slight sag along the top of the tracks. If Revell made the top row of track longer, it would be easy to bend in some sags, as it is, not enough track to get more than a slight sag. Update 30 August 2012. Below is the 'ball turret' assembled, minus its hatches. I have not decided whether to leave the hatches open or not. As there is no interior detail I may just leave the top hatch open, and put a figure in it. There is a line where the two halves of the ball turret join that needs a very light sanding. This line would not be seen when gun is in the travel position, but if guns are elevated the line becomes visible. Another view of the ball turret, before guns were attached. Turret in place and elevated. I damaged one of the lifting hooks when cutting another piece from the sprue, so used same diameter wire to make the rear hook, and attached with liquid CA glue. The hooks don't need replacing, they are nicely cast, if I hadn't damaged the hook I would have used the kit supplied one. Last job to do is attach hatches and exhaust system, then undercoat the model. Still unsure what kind of paint scheme to do. Update 02 September 2012. In the below picture the hatches have all been added, (just one left open), as well as the barrel travel lock & the exhaust unit. I was thinking of adding late 'J' style exhausts, but this vehicle has 4 return rollers, and the 'J' model seems to have been made with 3, so thought it best to stick with this being a 'H' model. Below are the two parts, complete and waiting for a base coat. Only parts still to add are spare road wheels and track links. Update 09 September 2012. Today I got the basic paint job on the flakpanzer. There are no know photos of this tank in existence, so how they were painted is anybody's guess. I went for a scheme that I hope looks late war, it still needs a little tidying up, washes, detailing, etc. The Yellow is Revell Semi Matt 314, the Green is Revell Matt 68, the Red is Humbrol Matt 113. Update 16 September 2012. I quite liked the soft edged sprayed camouflage on the 09 September update, but decided a more geometric and a more sharply defined pattern might be more 'late war' looking. As no photos exist its pure speculation how these were painted, but below are two in progress pictures of how the paint job looks at present, still more work to do. Figures on the tank are Caesar and Orion. I should also add the spare track lengths to the front, the rear lifting hook on the turret and the spare track links. Last photo is poor quality as the camera batteries were too flat to fire a flash, I will add a better photo or two in coming days.